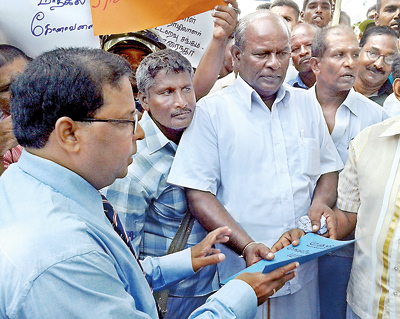 Leaders of the fishermen representing those from the North met with Fisheries Minister Mahinda Amaraweera on Monday reiterated their stand on boycotting the next round of talks with their Indian counterparts. The leaders have raised the issue of ongoing poaching by the Indian fishermen and the Government’s position to solve the issue through diplomatic channels. Naganathy Ponnambalam, a leader representing the Jaffna Fishermen’s Association told the Sunday Times that he had urged the minister to find a solution by taking up the issue with the Indian Government through diplomatic channels rather than by having talks between the fishermen’s representatives of the two countries. “We have made it clear to the minister why we are refusing to have talks with them. He also agreed with our concerns,” he said. During the one hour meeting with the minister and his officials the fishermen’s leaders discussed ways to improve the fisheries industry in the Jaffna peninsula. The Fisheries Ministry decided to set up two fishery harbours and five anchoring harbours in the peninsula as a first step to improve the fisheries sector in the Northern Province. On Friday seven Indian fishermen from Nagapattinam engaged in poaching in Lankan waters were arrested in the sea off Point Pedro. A boat was also seized by the Navy. The Navy handed over the fishermen and the boat to the Fisheries Department for legal action. This arrest comes after the fourth batch of Indian fishermen were arrested during the course of this week. The last arrest was made in the seas of Kalpitiya where another seven Indian fishermen were nabbed on Monday. The Puttalam Magistrate ordered to remand them until October 5. The Navy said it conducts routine patrols and surveillance to ensure the security of the surrounding seas. 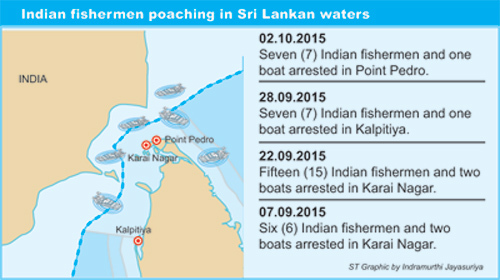 Following directives from President Maithripala Sirisena, the Navy will continue to arrest poaching Indian fishermen and local fishermen engaged in illegal fishing in Lankan waters. Meanwhile Tamil Nadhu Chief Minister J Jayalalithaa, following her letter last week seeking early release of arrested Indian fishermen has written a strongly worded letter to the Indian Premier urging him to launch a ‘strong diplomatic offensive’ against Sri Lanka. “I have been requesting the Government of India to wage a strong diplomatic offensive to uphold the rights and interests of our Indian fishermen from Tamil Nadu. The Sri Lankan Government continues its series of arrests of our fishermen while fishing in their traditional waters,” she said. Parliament is to debate next Friday the ongoing poaching by Indian fishermen. The Peoples Liberation Front (JVP) brought an adjournment motion calling for a debate on this subject. JVP leader Anura Kumara Disanayake is expected to open the debate.